As a person that appreciates symmetry and patterns in nature, I was intrigued this morning when I saw that I was following exactly 10,000 people on Twitter. Even better, I am only 8 followers away from 11,111 which in some ways, is an even more perfect number (no official reason, I just like the symmetry better). I don’t normally mention following numbers in public as it’s a turn off but I couldn’t resist if for no other reason than the fact the reason I mentioned in the first sentence. I wasn’t really expecting any responses other than maybe a snarky “who cares” or “I just unfollowed you so now you have 9,999.” Instead, I got some thoughtful replies from folks like Adam Zand, Chris Selland, Dan Blank, Alex Howard and Hadley Stern. To Chris’ point, I may not “really be following” all 10,000 of the people I have connected with on Twitter, but I believe that my willingness to follow back gives these folks a feeling of connection and makes them feel like they can DM me or @ me when they like (I try and respond to all personal @’s and DMs). In fairness, I also have an “all friends” column in Tweetdeck and at least a few times a day, keep an eye on this open stream for new folks to add to my inner circle of people to follow. Adding a third item to this that I tweeted after the fact, the serendipity that I’ve enjoyed as a result of engaging with such a broad audience has led to some amazing things like new business, podcast interviews and even the opportunity to write the foreword to Janet Fouts latest book. While I realize that my strategy doesn’t work for everyone (just like I’m finding out that my blog-reading strategy varies wildly from person to person), it seems to be working for me. I’m not sure what happens when this number grows to 15,000 or 20,000, right now, I’m going to keep adjusting my filters and enjoying the benefits of lots of social “friends” to give and receive valuable information on research, restaurants and rollodex access). 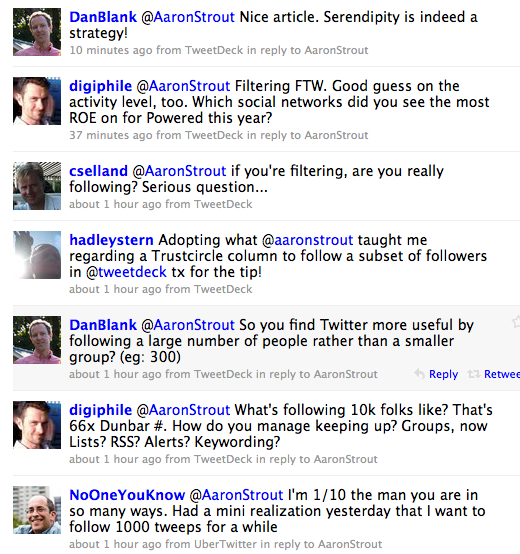 What is your Twitter follow strategy?